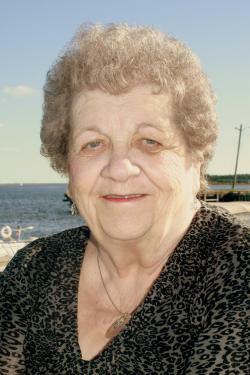 At the Community Hospital, O'Leary, on Saturday, October 13, 2018, with her loving family by her side, of Bridget Mary Milligan, beloved wife of Gerald W. Milligan, of Dock Road, Alberton, age 76 years. Born at Fogo Island, NFLD, on August 25, 1942, she was the daughter of the late Louis J. and Rita B. (nee Foley) Jones. Loving mother to Grant of Alberton, Gary (Ellen) of Hammonds Plains, N.S., Geraldine (Leo) Doucette of Pleasant Grove, P.E.I., and Jason (Sabrina) of Dock Road, Alberton. Cherished grandmother to Miranda (Ruairi) Devlin of Pleasant Grove, Alicia, Ryan and Olivia Doucette of Pleasant Grove, Amber Milligan of Hammonds Plains, and Allie and Ben Milligan of Dock Road, Alberton. Great grandmother to Ava Doucette. Dear sister to Sheila (Dr. George) Saunders of Charlottetown, Gary (Dianne) of Charlottetown, Louis of Saint John, N.B., Stella (Pius) Doyle of Dartmouth, N.S., Roger of Charlottetown, Brent of Halifax, N.S., Blair (Annette) of Argyle Shore, Bruce (Linda) of Alberton, and Renita (Michel) Gallant of Charlottetown. She will be sadly missed by her many nieces, nephews, brother and sisters-in-law, and friends. Resting at the Rooney Funeral Home & Chapel, Alberton, for visiting hours Tuesday 2 to 4 and 7 to 9 p.m. Funeral Wednesday from the Sacred Heart Church, for funeral mass at 10:30 a.m., Rev. Andrew MacDonald, celebrant. Interment in the church cemetery. As an expression of sympathy memorials to the Sacred Heart Church Cemetery Fund would be gratefully appreciated. Rooney Funeral Home & Chapel, Alberton, P.E.I. Sacred Heart Cemetery, Alberton. P.E.I.